You have to love modern technology. This is my niece and nephew who are currently incubating in my sisters stomach. 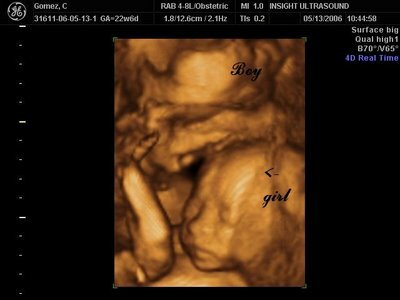 But thanks to 4-d ultra-sound and cd-rom I can bring you a picture here on my blog. Gotta love it. You know how much I love instant gratification. Now instead of my sisters belly being a constant guessing game (Leaving me stressed and frustrated by questions like, "Is it a boy or a girl?" "Is it twins?" "What do they look like?") I know excalty what they are, how many and what she looks like. Oh very cool! I thought about dishing out the dough for one of these 4D's during my pregnancy but figured I should just take the one the insurance will pay for! Even cooler they are twins. Congrats Aunty.